ABC, the only TV network with a dedicated iPad app for streaming its programming, is showing signs of success in its transition to the brave new medium, with 205,000 app downloads so far. The Wall Street Journal reports on the numbers, which indicate that about 40 percent of all iPad owners have given the app a spin. The network is pleased with the results, and notes that 650,000 televisions episodes have been watched in whole or part on the iPad. ABC is delivering standard 30-second advertising spots during its iPad streams, but aims to develop more interactive and locally targeted ad content later this year. ABC says it has delivered several million ad impressions, and the company is still analyzing the results. Viewers are subjected to fewer ads than if they watched the shows in the traditional broadcast format, however; the streaming shows include only five 30 second ads per hour. 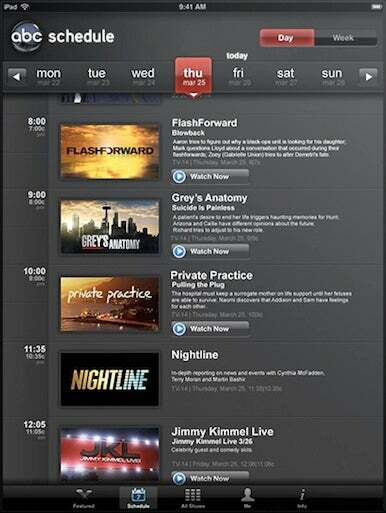 The app also includes links that let viewers buy episodes from Apple’s iTunes Store. ABC’s jump on its network competition has nothing to do with the fact that Steve Jobs is on the board of ABC parent Disney. A 12 person software team got to work shortly after Apple announced the iPad on January 27. But like all other app developers, they had to rely on iPad simulation software and didn’t get their hands on the real thing until launch. The ABC episode most streamed so far? An installment of the popular sitcom Modern Family that tells the tale of a middle-aged father’s longing for an iPad.